While I did not climb Mount Everest when I arrived at its base in 2006, my journey to the world's tallest mountain left me feeling a little bit like I had scaled its heights. In fact, there were different times during my journey that I almost gave up on going to see it. Traveling alone in Tibet as a foreigner was one of the most difficult challenges that I have ever faced. Or maybe I just did not choose the most conventional ways of getting from place to place. I definitely did not choose the most conventional way of reaching Tibet from my home in Central China. I couldn't take a train. I actually began my journey three days before the first train was to arrive in Lhasa from Beijing on the world's "highest altitude" railway line. I could have flown from Chongqing or a number of other cities in the West of China but that option was expensive and in my opinion slightly "boring." So, I chose to take the "adventurous" route by entering Tibet from the city of Golmud (Gah-Ra-Moo) which lies in Gansu province on the edge of the vast Tibetan plateau. When I arrived in Gansu, I had a choice to make regarding my journey to Tibet. I could purchase a "government package" or I could find my own transportation into the autonomous region. The government package supposedly included a travel permit (which few have actually ever seen), a ride on a government-approved bus, and a three-day stay at a government-approved hotel in Lhasa. This sounded like a little too much supervision for my liking so I decided to find my own way. This proved to be quite easy as there were a number of bus operators who approached me as I exited the train station in Golmud. They agreed to let me travel on their bus provided that I stayed on the bus until it departed and that I followed their directions should we encounter any police along the way. Through this option, I was able to save about 500 Chinese renminbi (RMB) [$71.56]. Unfortunately, I had to wait on the bus for three hours but I was able to open a window and enjoy the breeze. The trip to Golmud to Lhasa was supposed to have lasted about 24 hours but because of some mechanical problems, we did not arrive until 28 hours later. During the night, we were at altitudes of up to 5,000 meters [16,405 feet] and I woke up at one stretch with a slight headache and shortness of breath. There were other people moaning throughout the night including some very elderly monks who seemed to be in great discomfort. I was thankful that my "altitude sickness" symptoms were very minor. I arrived in Lhasa at about 2 in the afternoon. Despite the fact that I was exhausted, I spent a few hours trudging around the city looking for a decent hotel to stay in. I finally found a room at the Banak Shol Hotel near the downtown area of Lhasa. The price was reasonable and the room seemed warm and comfortable. I spent a few hours sleeping before I started exploring the town. The next few days were exciting and eye opening. I spent hours exploring the Barkhor Circuit, Jokhang Temple, and the Potala Palace. I also explored some of the city's restaurants and talked to many foreigners and native Tibetans. As exciting as my days spent in Lhasa were, I was anxious to continue my journey to Mount Everest. My next stop in Tibet was Shigatse, the third-largest city in Tibet. Shigatse is located about 250 kilometers [155 miles] southwest of Tibet and I arrived by minibus in under 4 hours. I stayed in a vibrant place called the Tenzin Hotel with modern rooms and a great restaurant with food from China and Nepal. While I was in Shigatse, I went to visit Tashilhunpo Monastery, which has been the home of the Panchen Lama for hundreds of years. I also visited some colorful markets and climbed a nearby hill where they were reconstructing an ancient fort. As exciting as my stay was in Shigatse, I was still "itching" to continue with my trip to Mount Everest. Perhaps my blind enthusiasm is what caused me problems on the next leg of my trip. From my hotel, I was told that I should continue my journey to Everest by taking a minibus to Lhatse. From there I was told that I could catch a jeep to Tingri, near the base of Mount Everest. The journey to Lhatse from Shigatse was not nearly as smooth as my previous trip from Lhasa to Shigatse. Not all of the road was paved and there were frequent rock obstructions on the road due to small landslides that had occurred. The trip lasted about well over eight hours and by the time I arrived in Lhatse, I was once again exhausted. The three days that I spent in Lhatse will go down in my travel history as a depressing and frustrating time. I had been misled; there was no way for me to continue my travel from Lhatse to Mount Everest. For three days I waited for public buses that never came and tried to convince jeep drivers to let me "tag along." In the end, I found out that foreigners were not allowed on the public buses and that even if foreigners agreed to let me ride along with them on a jeep, the Chinese drivers would not permit it. I even tried hitchhiking on the road leading out of town but all I got were a couple of friendly honks. So, basically, I spent three days wandering around this small Tibetan town; there was very little to do. I did have, however, the chance to observe closely daily life in Tibet. I saw people urinating on the streets, 10-year-old children smoking, and sheep being slaughtered in front of a restaurant. I also encountered the kind of deep poverty that is so common in Tibet. There were people who were hungry and were more than willing to eat my leftover breakfast. After three days, I couldn't get out of Lhatse soon enough. I had never been so discouraged in my life when I had to get on a minibus and backtrack to Shigatse. I was so frustrated and angry. I felt that I had wasted three days and I was afraid that I would never reach the base of Mount Everest. Adding to my sorrows was the mechanical problems that my minibus experienced on the way back. I stood outside on the Tibetan plateau as the sun set waiting for two hours for a taxi to come and pick us up. This was the low point of my journey. Back in Shigatse, I stayed at the same hotel again and this time I was told that I could take a jeep directly to Shegar, which is the closest town to Mount Everest. It would only cost me 300 RMB [$42.94]. I rejoiced and restrained myself from asking angrily why I had not been given this information before. The next morning, after a good night's sleep and a delicious breakfast of naan bread, a driver called me to his jeep and I was on my way. I was so happy that I barely even noticed as we passed through Lhatse. I was going to Mount Everest. About 20 kilometers [12.4 miles] outside of Lhatse, we encountered a roadblock; this time it was human. My driver and I were told that there was road construction taking place further down the road and that the road would not be opened until 7 in the evening. I was about ready to slit my wrists. This couldn't be happening. Fortunately, I wasn't the only one who was unhappy with the situation. Behind us there was a stream of other trucks and jeeps and people began to get out of their cars and complain to the guard. The discussion soon turned into a shouting match. People were making all kinds of threats. The guard was telling people to go and complain somewhere else. Well, the complaining didn't stop and I guess the guard got tired of talking. Miraculously, he opened the gate and we continued on our journey; I was relieved. The next seven hours of the trip made up for the frustrations that I had experienced a few days earlier. It was a sunny day and the scenery was breathtaking. We stopped for a few minutes near the entrance of the Mount Everest Nature Preserve and I was able to interact with some beautiful (but dirty) Tibetan children. My excitement grew as we got closer and closer to Shegar. For a town that is so close to the magnificent Mount Everest, Shegar was not much to look at. In fact, I hardly believed my driver when he pointed at a few buildings in the distance and told me that we were close to Shegar. But it didn't matter; I was closer than ever to reaching my dream destination. I could only hope that my days of frustration were over. When we arrived in Shegar, I did not waste any time in finding a hotel and acquiring the necessary papers to visit Mount Everest. My room at the Everest Home Inn was not fancy; the TV didn't work and the hot water was sporadic at best. But I hadn't come all this way to drown myself in luxury. It was a roof over my head and I was thankful for that. I was able to purchase the ticket that I needed to visit Everest at another nearby hotel. After three hours, I had everything that I needed. But how was I to get to base camp? When I first inquired about transportation, I was told that there were no other foreigners in the area who were interested in going to the famous mountain. I would have to rent a jeep myself and pay over 1,000 RMB [$143.21] round trip. This was discouraging; I never dreamed I would have to spend so much money once I arrived in Shegar. Then I had an incredible stroke of luck. About an hour later, a jeep pulled up and four people that I recognized hopped out. They weren't foreigners; they were a group of Chinese tourists. I had seen them at the roadblock hours earlier outside of Lhatse. One of the men, an older gentleman, spoke very good English. He had been one of the people yelling at the guard back near Lhatse. I had briefly spoken to him then but I had no idea that he was also heading to Shegar. He told me that they were also planning on going to Mount Everest and that I could split the costs with them if I wanted to go. Once again, a wave of relief spread over me. That night at dinner, my new friend did some hard bargaining with the driver of a jeep. Because I was so happy to have a chance to go, I agreed to pay 400 RMB [$57.25] while the people in the rest of my group would pay 200 RMB [$28.64]. It was settled over steaming bowls of rice and a plate of delicious tofu. I was going to Mount Everest. Someone was banging on my door the next morning. I must have overslept. It was almost time to go. I quickly grabbed my bag and headed to the restaurant where my new friends were enjoying breakfast. Ten minutes later, we all hopped in the jeep and began the journey to Mount Everest Base Camp. There is a lot more that I could write about; maybe I will someday. I could tell you how we were stopped by the Chinese police and how my Chinese friends did not have their proper identification papers. We were almost sent back. I could tell you about my 5-kilometer [3.1-mile] walk to the base camp from the Rongphu Monastery and how one of my friends and I thought that we had been left behind by the jeep later. But for now I will just tell you that I did finally arrive at Mount Everest. It was a day that I will never forget. The majestic peak was clearly visible through the clouds; the surrounding rugged landscape was breathtaking. Nearby there were musk deer roaming around and I had a chance to get close and take photographs. I was even allowed to freely roam the Rongphu Monastery; no one seemed to care. It was a day that I would dream about; I still do even now. 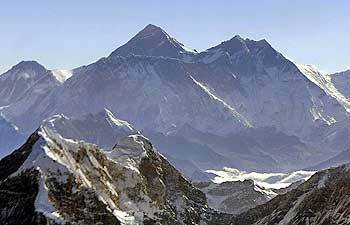 If you visit Tibet, you must go and see Mount Everest. After I left Shegar, I visited many other places in Tibet but Mount Everest was the highlight. Just make sure that you hire a good guide or do some good research before you go. But I promise that you will not regret it. I cannot wait to go back someday to Tibet. I imagine that it has changed greatly. In fact, when I came back to Lhasa a week later, the first train from Beijing had already dumped its Han occupants upon the town. The city seemed much busier and more crowded. I guess I feel fortunate that I was able to see Tibet before the trains started running. But for me, Tibet and Mount Everest will always represent a time in my life of challenge and great satisfaction. I learned a lot on that trip about Chinese culture and about myself. Would I do it again? In a heartbeat.